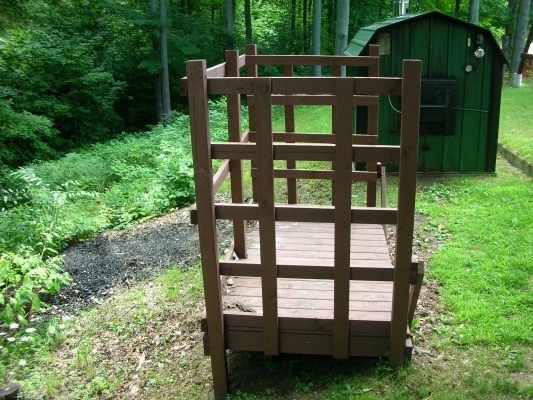 A firewood storage rack is a device used to hold your processed firewood. After the wood is cut and split you need to have a place to store the firewood until your ready to use it. Simply laying the firewood on the ground is not sufficient. Firewood that comes into contact with the ground is exposed to moisture and insects. Wet wood can decay and can also grow mold and fungus. You do not want to bring mold and fungus covered logs into your home and burn them. To protect your hard work and investment, stacking your wood on a firewood rack can help keep it dry and free of unwanted insects. Metal racks can be purchased almost anywhere and generally come in either 4 foot or 8 foot options. 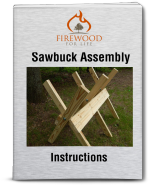 You can also buy a kit that contains brackets to easily assemble your own rack. Of course, you always have the option of making your own from scratch using a few 2x4's or other building material. I built a homemade firewood rack next to my outdoor wood furnace a few years ago. The bulk of my firewood is stored about 80 yards away from my furnace. Carrying firewood across the lawn everyday was time consuming and a waste of energy, so I decided to build a device close to the wood furnace that could hold about two weeks worth of wood. This way I only needed to move firewood once every two weeks which is much better than every day. Now, ideally you would want the wood furnace next to your primary firewood storage area, but in my case this was not possible so I came up with this idea. 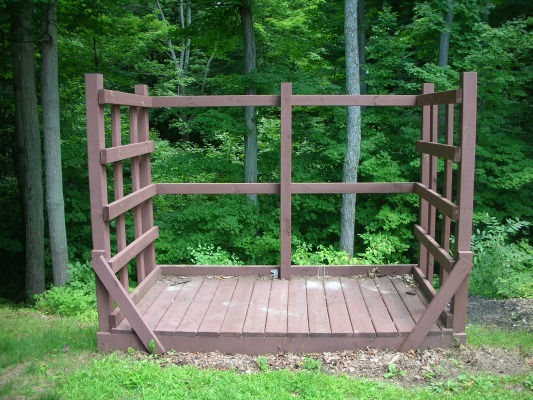 The rack is built out of 4x4's for the corner posts and 2x6's for the base covered by deck boards. 2x4's make up the rest of the structure. The rack is 4 feet x 8 feet and stands 5 feet tall. All of the lumber used was treated. I started by setting the 4x4 corner posts. They are cemented in the ground to add stability and prevent them from bowing out when the stacked wood is pressing out on them. Next I constructed the base out of 2x6 lumber. I chose 2x6 due to the heavy load of the wood being stacked upon it. As you can see from the pictures the lawn slops off towards the woods so the base is actually suspended and not resting on the ground. The base is covered with standard deck boards. The rest of the horizontal and vertical supports are made of 2x4's. They serve as support for the rack but also give me something to stack the wood up against. Finally I added two 45 degree supports on the front corners to keep everything square. Once the rack was finished I added a coat of deck stain to match my nearby deck and protect it from the weather. The firewood storage rack works great and saves me a lot of time. I load it full of wood using my tractor about once every two weeks. Now, instead of carrying the wood 80 yards I only carry it a couple feet.